Never one to rest on their laurels and following several years of speculation, Sunseeker announces the forthcoming launch of a brand-new high-performance day boat – the Hawk 38. 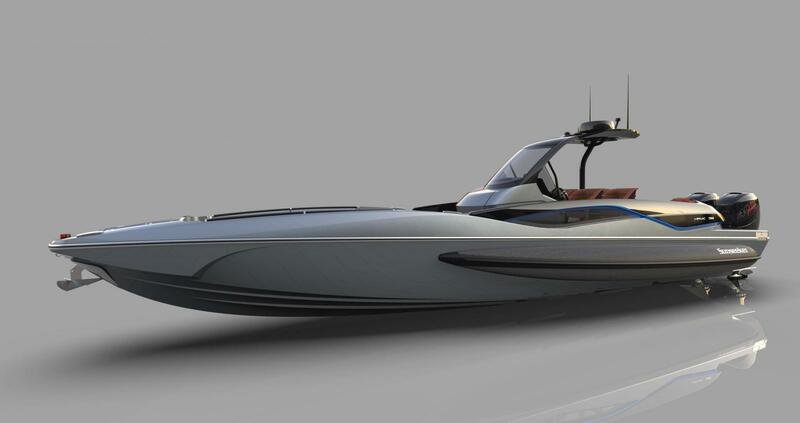 Sunseeker has returned to its performance roots to deliver an exciting and dynamic stepped hull in conjunction with Fabio Buzzi Design, winner of 43 World Speed Records and 55 World Championships! 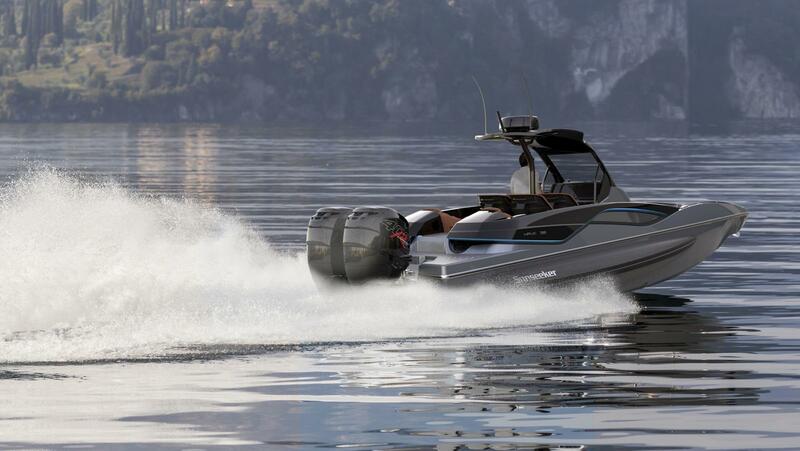 Drawing on the company’s racing heritage, the new high-performance model will be capable of a leisurely 70mph (62kts) ‘out of the box’ with standard twin Mercury R400 outboards mated to Mercury Racing Digital Zero Effort throttles. The hull has been optimised to take advantage of the latest outboard engine technology giving not only performance benefits but also low-cost maintenance for clients. For even more performance, other outboard engines are available to special order. The all-new FB Design patented structural foam hull with ‘anti-dive’ bow not only makes for an unsinkable boat but also moderates vibration and noise transmission to an absolute minimum. To reduce lateral pitching and increase comfort and safety whilst running at high speed, inflatable Hypalon 866 STAB® tubes are fitted as standard and provide the added benefit of built-in fendering for easy boarding and stability at anchor. Whilst the incredible design, features and equipment delivers ultimate day-boat appeal, its searing performance will ensure it’s always first to the best anchorage or beach restaurant. With a choice of paint finishes and upholstery, it will also make the ultimate superyacht chase boat; no two boats are ever likely to be the same. For those looking to soak up the sun while at anchor, the foredeck is complete with a sunbathing pad with elevated fixed headrests and an optional foredeck sail canopy. Aft facing u-shaped seating is centralised around a quick release carbon or painted table that can be stowed in seconds. The helm station is centrally located, shielded by an integrated double-curvature ventilated glass screen with a sweeping black carbon fibre hard top and side screens to deflect the wind. Fitted with a Simrad navigation system, the helm console consists of the very latest 16-inch Evo 3 touch screen multifunction display with GPS and Wi-Fi capability. The Simrad screen gives access to the CZone® DC switching system to allow integrated control of all essential systems including lighting, batteries, pumps and LED navigation lights. In addition, the Lumishore LED lighting package is controllable from the Simrad screens via the Lumi-Link smart lighting application to offer a spectrum of colours and effects. Power-assisted steering is courtesy of the intelligent leather trimmed tilt steering wheel incorporating full control of the navigation system. Positioned under the helm is the toilet compartment, complete with vanity unit, stainless steel hand basin, skylight and CZone® DC switching system master panel; replicated through an additional 5” colour touch screen to ensure full redundancy for critical systems. Aft of the console are four FB Design racing seats built for speed and performance. With shock absorbing mitigation, 120mm stroke, electrohydraulic actuators and electric bolsters, occupants can either sit or stand for optimal comfort and safety. At the stern, there is a triple bench seat with the possibility for two drawer fridges located under. Ease of access is afforded to the large technical compartment via a hinged access hatch. Throughout the boat, there is multiple built-in storage such as a cavernous stowage locker with carbon fibre lid at the bow, which can be utilised for a plethora of toys including two SEABOB’s with dedicated bulkhead-mounted charging units. The self-draining composite decking in platinum with white corking includes yet more stowage with a large central deck locker that can hold a life raft or inflatable paddleboard. Every last detail in the boat has been designed with performance in mind down to the carbon fibre grab rails with polished stainless-steel mounts, retractable cleats, compression latches and a custom audio system with polished stainless-steel speaker grills, aft facing swim speakers and optional subs. Commenting on the Hawk 38, Sunseeker CEO, Christian Marti said: “The heritage of the Sunseeker brand is unparalleled; built on a legacy of developing small performance racing boats, we are the technical experts in this field, and it lies within the brand’s DNA. 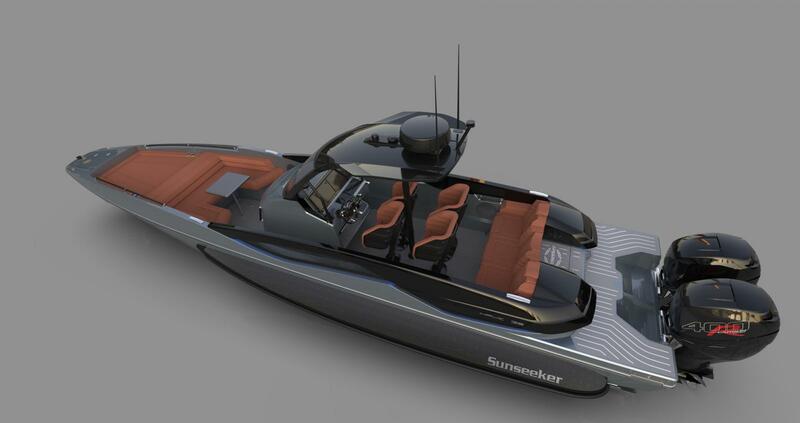 Having worked previously with FB Design on the XS2000 and XS Sport as far back as 18 years ago, Sunseeker has always dominated this area and will continue to do so with this technologically advanced cutting-edge new model.